The SAD part of the story: “the axis was real jerky and continued to get worse until it QUIT”. Ouch! Quitting on the job is never good, human or machine. 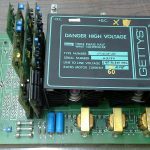 So, what’s up with this nice looking Gettys DC Drive controller? It quit on the job! This happened in a mid-west U.S. custom fabrication shop after our customer replaced a drive motor. Suddenly there were problems. DC drives like this are awesome for providing variable speed controls for DC motors. This is especially true with applications that require low speed control, torque, and power. They are relatively simple machines so what could go wrong? 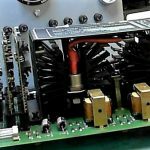 As it turns out, aging components were the main culprit – the control boards needed to be entirely rebuilt including new opamp ICs, all new capacitors, and all new transistors. Legacy and older drive controls like this are often repairable and this one was no exception. Out-of-warranty units can still be repaired. If yours is still under warranty, get in touch with the OEM first as they will likely be able to service the unit or replace it if it is defective. The HAPPY part of the story: this Gettys controller tested fully operational after repairs and is back in the fabrication shop. No budget-busting new control required! If your damaged Gettys or other drive controls need repairs, or you are not sure, we can help! About the Author: ACS Industrial is an independent, third party industrial electronic repair center providing repair services for controls of all types and most all manufacturers as well as servo drive repairs, AC/DC drives, VFD drives, servo motors, encoders, printed circuit board repairs, monitors and touchscreens, HMIs, test equipment, light curtains, and much more. Our customer service team is available to answer your questions and help solve your industrial electronic repair concerns. Legacy equipment can be repaired! RUSH Service is available. You can reach them by calling 800-605-6419.